In the early stages of the Civil War in 1862, Union forces quickly seized the Outer Banks of North Carolina during the so-called Burnside Expedition, which led to the creation of a Freedmen’s Colony on Roanoke Island, a safe haven for hundreds of runaway slaves in the region. While the colony was decommissioned after the war, it remained a symbol of freedom and today is remembered as part of Fort Raleigh National Historic Site, situated on the northern tip of the island. Although the primary draw of the park is the 16th century English settlement established on Roanoke, the 1.1-mile “Freedom Trail” serves as a reminder of the island’s Civil War past. 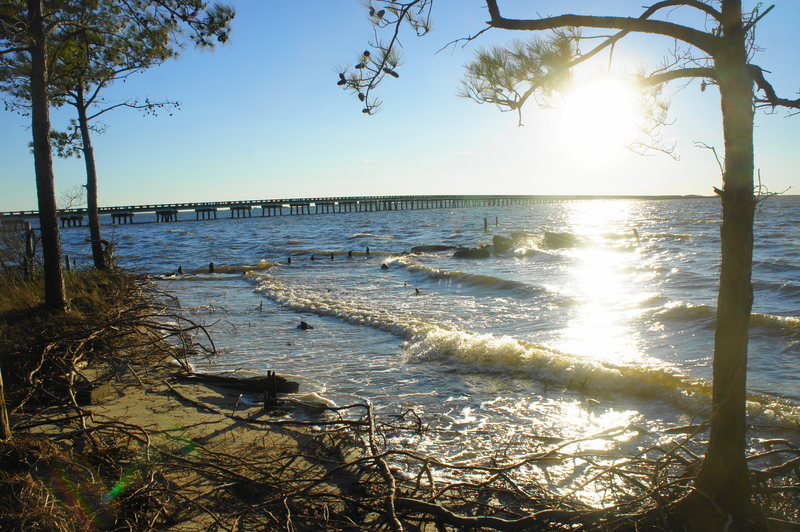 Although there are no historic traces of the Freedmen’s Colony along the trail, the wide and easy path weaves through maritime evergreen forest en route to the sea and ends at a lovely beach on the banks of Croatan Sound. The Freedom Trail begins on the western fringe of a cul-de-sac in Fort Raleigh National Historic Site, across the circle from the entrance to the Elizabethan Gardens. 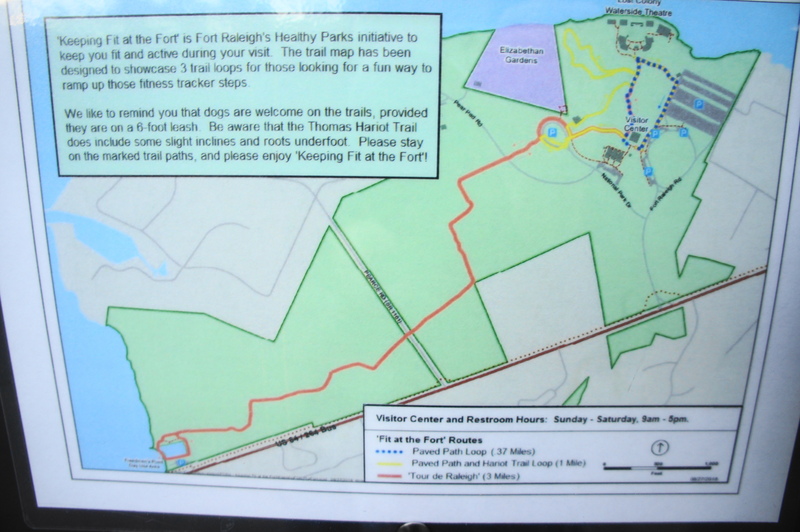 (Note: It is easy to reach the trailhead from the Fort Raleigh Visitor Center by taking the northwest-bound paved path toward the gardens entrance.) 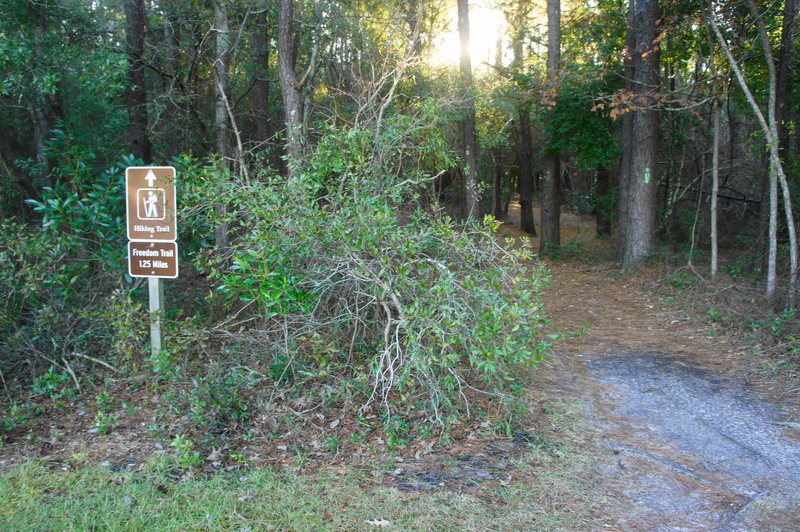 The wide but unpaved trail, marked with lime green blazes, immediately dives into thick woods, an evergreen maritime forest dotted with holly, live oaks, laurel oaks, and loblolly pines. The forest here is relatively old, having recovered from previous periods when the woods were cleared for development. Less than 100 yards into the hike, the trail traverses the paved but narrow Pear Pad Road, then continues its southwest-bound tread. About 150 yards from the road, the trail bears sharply right, following an old track southeast. Within a minute, the path cuts right again before repeating the southeast turn once more moments later. Here loblolly pines tower high above, creating a yearlong canopy. At about 3/10 mile, the path resumes its southwest course and descends a long straightaway to cross Weir Point Drive. Now around ½ mile from the start, the Freedom Trail continues past the road, reentering the thick woodland. Within minutes, hikers approach a noticeably younger stand of smaller pines, and the trail cuts right. It is roughly 5-10 minutes from here to a point where the trail emerges out into the relative sun, with thick undergrowth on either site. (Note: This area is often muddy and collects puddles of rainwater.) By now hikers can hear the sounds of human development again: the whizzing of cars on US Route 64 to the south. 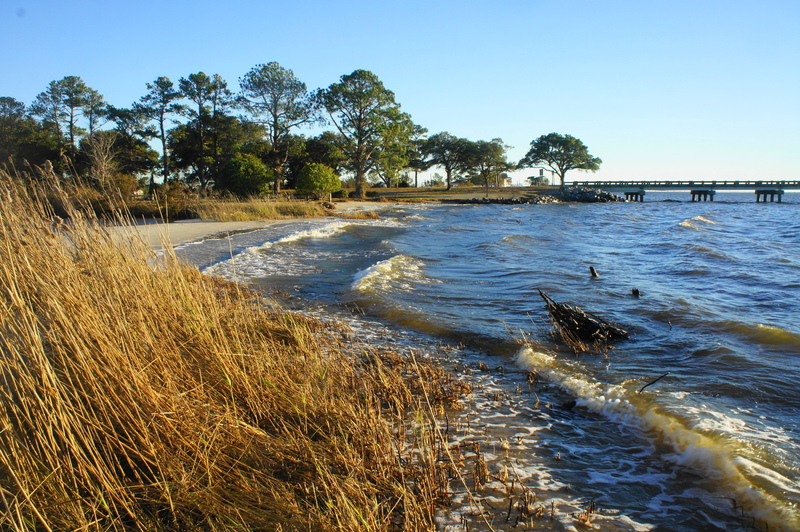 At the 1-mile mark, the trail splits, and one can sense that the shores of Croatan Sound are near. Heading straight offers the quickest access to the beach—less than 150 yards to the wind-swept shores. Here one can peer across the sound to mainland North Carolina, and all of the William B. Umstead Memorial Bridge is in view. 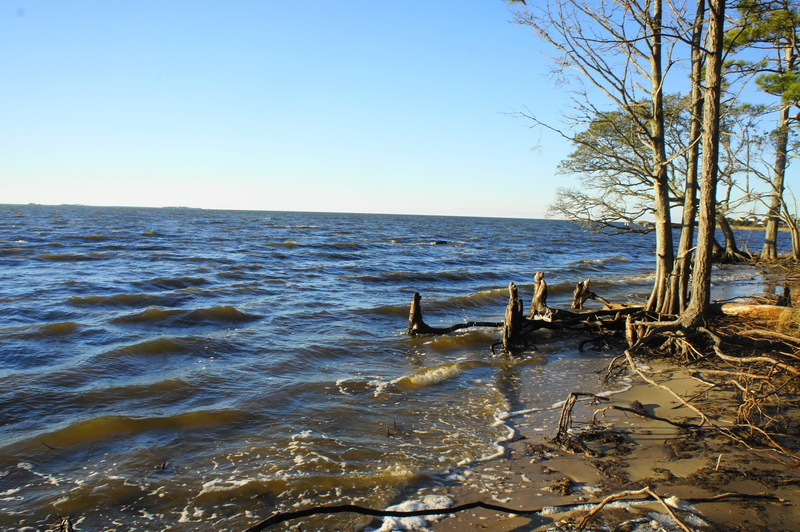 This vista also roughly marks the point where the Croatan Sound merges with the larger Albemarle Sound to the north. Off to the south, hikers can spot a parking area with historical markers: this is the official end of the Freedom Trail. Access from the beach, however, depends on the height of the tides—a thin strip of land separates the sea from a small tidal pool and is potentially passable. However, even at low tide, it is thick with reeds and not recommended. Instead, backtrack to the trail junction at the 1-mile mark and bear right, following the relatively narrow path around the tidal pool. The path ends at the small lot just off Route 64. 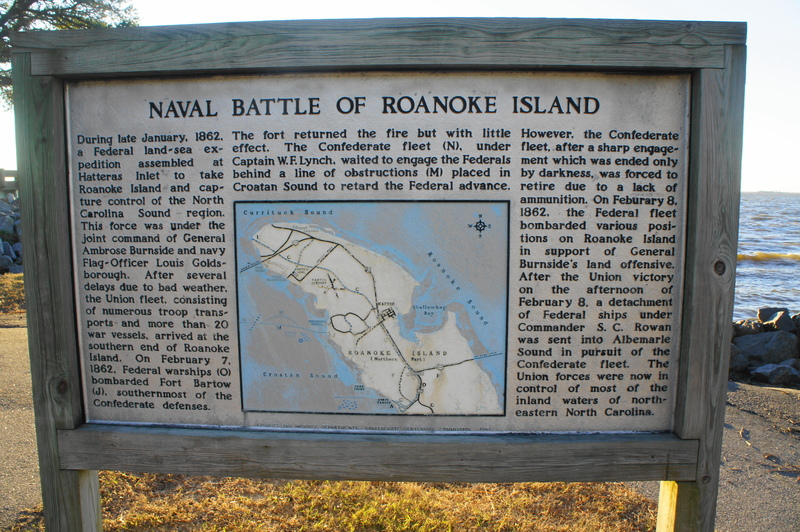 Here there is a large historical wayside dedicated to the story of the Naval Battle of Roanoke Island. The bulk of this battle—a clear Union victory on February 7-8, 1862—took place further south, with Gen. Ambrose Burnside’s forces overwhelming the small and underprepared Confederate contingent on the island. The island would remain in Union hands for the remainder of the war, which made possible the establishment of the Freedmen’s Colony for runaway slaves and enabled future Union offensives on the mainland. After taking in the sights, head back the way you came to complete the roughly 1-1.5 hour out-and-back hike. 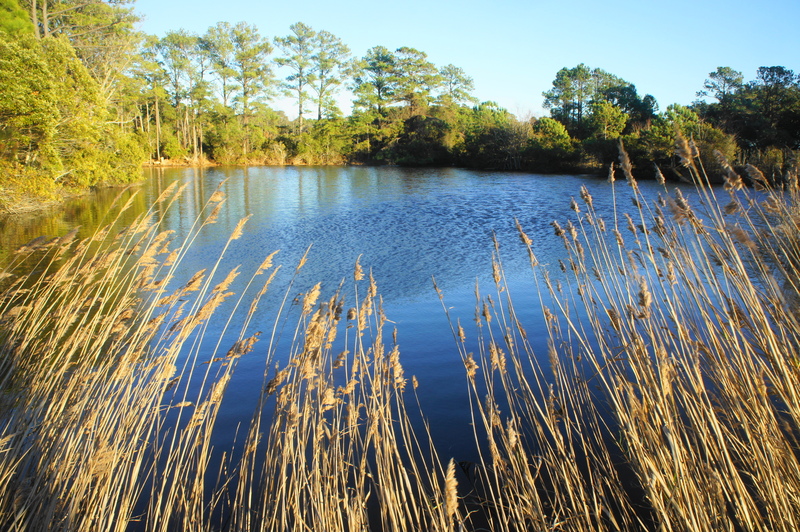 Walk amid the forest explored by English scientist Thomas Hariot during his expedition to Roanoke Island in 1585-86 on the 3/10-mile Thomas Hariot Trail. This entry was posted in Civil War, Easy Hikes, North Carolina, Outer Banks and tagged Albemarle Sound, Battle of Roanoke Island, Burnside Expedition, Civil War, Croatan Sound, Fort Raleigh, Fort Raleigh National Historic Site, Freedmen's Colony, Freedom Trail, historic, North Carolina, Outer Banks, Roanoke Island. Bookmark the permalink.